Otitis Media-isn’t that something to do with television or something like that? – That’s what I first thought, but now I know so much more. 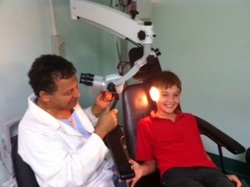 Four of my six children have been affected by Otitis Media and each of them discovered in different ways. Olivia, the eldest of twin girls was diagnosed when she was five, after endless ear infections that eventually corroded the three small bones in her ear. The closest Ear Nose and throat specialist was 145km away and I had to drive her there every fortnight to have her ears vacuumed. This was an event we both dreaded as she hated it so much and I felt helpless. After 11 operations including 2 sets of grommets, 2 adenoidectomies (removal of lymph nodes behind the nose in the back of the throat) tonsillectomy, numerous vacuums and 2 tympanoplasties (covering of the hole in the eardrum) she is finally on the mend. Due to the extent of her prolonged hearing loss she was able to receive one on one time with Rachel, a hearing support teacher who greatly helped to improve Olivia’s social skills and reading and writing levels. Olivia’s case was that bad and it’s not until now that I really understand Otitis Media, that I realise she was actually close to being one of the five children that die from OM each year in Australia. and his teacher mentioned to me that she had noticed a big change in his behaviour from a quiet content little boy to a ‘zoned out’ one. It turned out this change was because he couldn’t hear very well. A hearing test confirmed this. Dr Ridha was the ENT specialist in Dubbo at this point in time. After a year’s wait, Deklan got grommets fitted, a tonsillectomy and adenoidectomy. After his first day back at School following his operation he told me he didn’t want to go back to School anymore. After asking him why he replied “Because it’s too loud!” It brought a tear to my eye. After receiving reading support at School, Deklan’s literacy level has advanced and he is learning at the correct age level again. Alex, the eldest of the twin boys, was diagnosed only by chance as an audiologist visited his School and carried out checks one day. Alex was lined up to be checked because of the family history of OM and it was discovered he too had bubbles behind his Ear drum causing hearing difficulties. When Rachel Mills, the Hearing Support Teacher contacted me to let me know about the finding, I said “No, that’s Deklan not Alex.” Rachel assured me it was in fact Alex who had Ear problems too. I couldn’t believe it. Alex’s wait was much shorter than Deklan or Olivia’s as by this time I was very experienced at the whole situation and didn’t feel I could sit back and wait a prolonged amount of time again like I had to with Olivia and Deklan. Luckily the opportunity to have grommets fitted by Dr Rabie came along shortly after the diagnosis with an operation at the Dubbo Private Hospital. Alex only needed grommets so it meant day surgery even though he had quite a bad reaction to the anaesthetic and we almost had to stay overnight anyway. 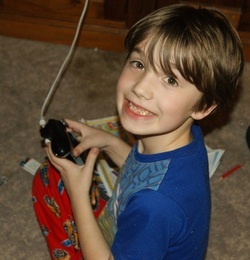 Alex also received Reading recovery help and it advanced his reading levels greatly. He is still slightly lower in his learning ability for his age, but we are working on it. 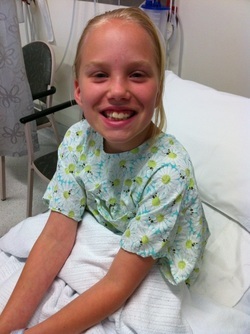 Samantha, the youngest of the twin girls had a hole in her left ear drum which was only discovered purely by accident. One day when I was checking if the boy’s grommets were still functioning properly, I looked in each of my children’s ears and got a big surprise when I looked in Sam’s. By the fourth child being diagnosed with Otitis Media, I was feeling as if I were a failure as a parent. Studies show that smoking around children and not breast feeding can cause OM but neither my husband nor I smoke and I did breastfeed each of my children as long as I could. I mentioned this to Dr Ridha and he said it was through no fault of my own that Sam had developed OM. 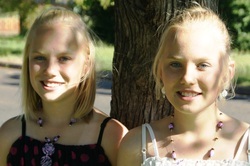 He strongly believed it was purely the fact that Sam and Olivia were identical twins who shared the same genes and environment and they were born prematurely that Sam ended up being affected by Otitis Media. I know the Ear Bus is not going to help my children, but it will certainly help the children of the future in the Central and Far West of NSW. The community really needs to get behind the concept and embrace the fact that it’s going to help. Hearing difficulties have a detrimental effect on education, social, mental and general wellbeing. The Ear Bus will help to diagnose ear health problems in students and treatment can be received early, lessening the severity of the disability.